Today we remember those men and women who died while serving in the US armed forces. Let's also remember to say thank you to those who have served and those who continue to serve. These 5x7 cards are easy to replicate quickly - take your choice of the vintage version on the left or a more "clean" version on the right. The main panel is made by cutting cardstock stars in white or cream and adhering them to a blue panel in a regular pattern. Cut off any overhanging bits, then mat on a red panel. 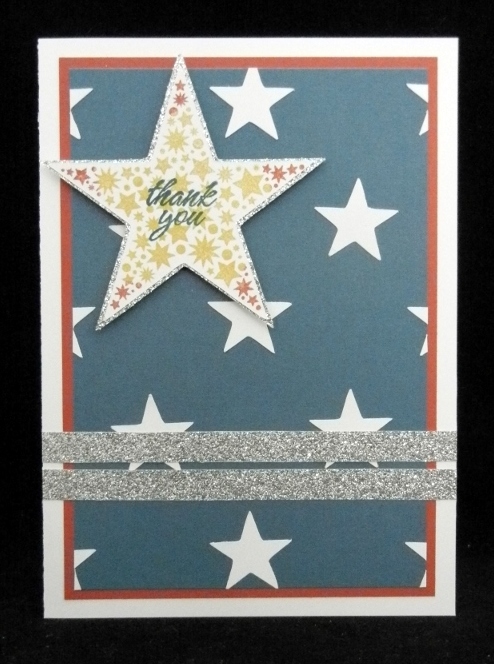 I used the Art Philosophy Cricut cartridge, as the star shape on that coordinates with the stamp I used. 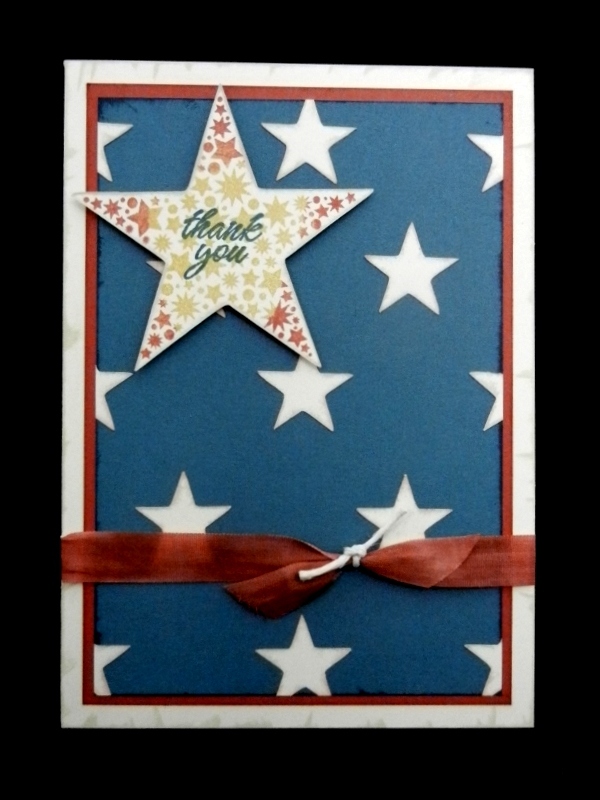 I used the patterned star stamp from the American Celebration stamp set, and used the rock and roll technique to stamp it with yellow and red inks. I then stamped the sentiment on top in blue ink. 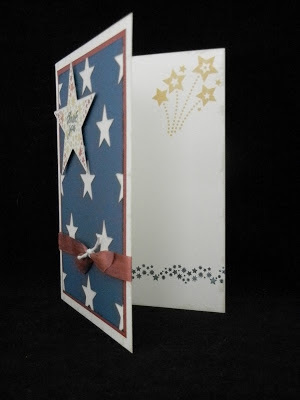 To embellish this card, I used silver Shimmer Tape as ribbon and also cut a star from silver glitter cardstock, which I used as a mat for my stamped star. For the vintage look card, I did everything the same except used cream cardstock instead of white, and took the added step of ink distressing all of my pieces. I also eliminated the bling of the glitter and instead colored a length of color-ready seam binding with a marker to match. I wrapped it around the card front and tied a piece of hemp around it to secure the ends. 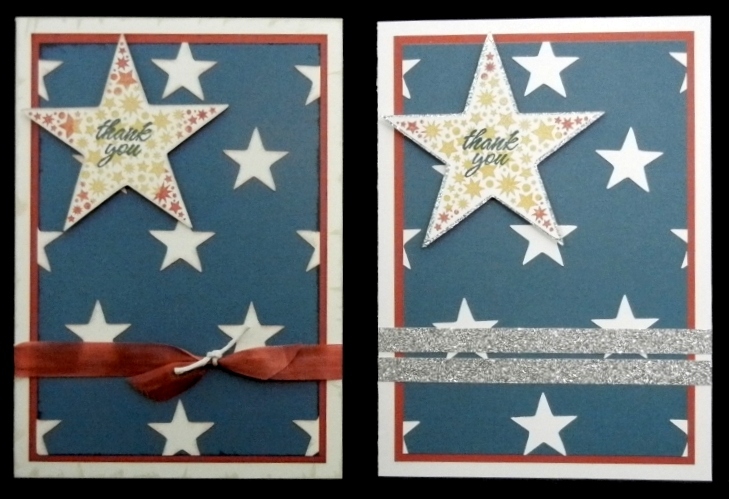 For both cards, I adhered the large star to the front using foam adhesive tape. 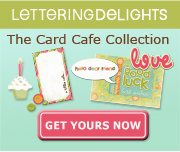 I also stamp inside the cards using coordinating images from the same stamp set. Now, while we are on the subject of thank you, I wanted to shared a brand new stamp from the unreleased Autumn/Winter Catalog that CTMH has decided to release early. One hundred percent of profits from sales of this stamp set from May 23 to June 30 will be donated to the American Red Cross to aid tornado victims in Oklahoma. a 2"x2" acrylic block is recommended for this stamp. Cost is $2.95 and is available on my website here. Supplies used for my cards today are all from CTMH. Thanks for stopping by today! 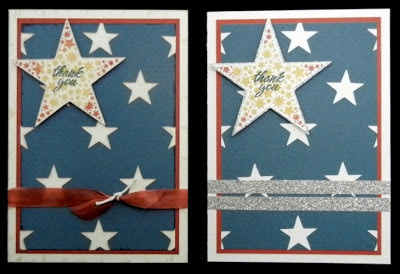 I hope you enjoyed my cards, and hope you have (or had) a fabulous Memorial Day!